We will now walk back on Powell to Market Street. San Francisco's main street - Market street -runs over three miles along eight neighborhoods. We can stroll on this large boulevard's brick sidewalks flanked by Canary islands palms, take a bus, street car, or a subway train to the Civic Center. Because the classic architecture and cultural events of the Civic Center complex make a trip there worthwhile and rewarding. We start in the Civic Center Plaza with the first building erected here: City Hall. The original building of 1870 was destroyed during the 1906 earthquake. The reconstruction project was influenced by the new ideal in American urbanization movement of the time known as "The City Beautiful". 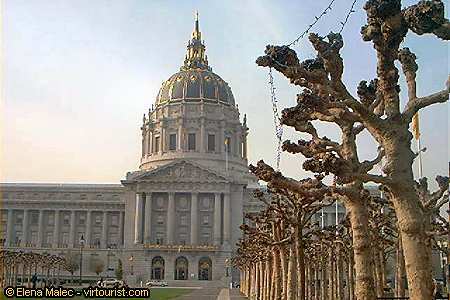 San Francisco City Hall' s impressive Beaux-Arts style building designed by Paris educated architect Arthur Brown Jr. opened in 1916. Built in gray California granite with blue and gold burnished ironwork, it was designed in French Renaissance style. The exterior is if Raymond granite from the foothills of Sierra Nevada. Its dome, inspired by the Dome des Invalides in Paris, is higher than the dome of the Capitol in Washington; San Francisco City Hall being the fifth largest dome in the world.